On 19th January 2015 I met up with a group of homeopaths from various parts of the UK at Terminal 4 Heathrow airport. We had all chosen to take part in a trip to India organised by the HMA Council with the purpose of visiting and gaining some practical clinical experience at some of the homeopathic hospitals and medical colleges in the state of Gujarat in India. Homeopathy is a well-established system of medicine in India and home to numerous homeopathic hospitals, colleges and research institutes and the government in India fully endorses and supports homeopathy. Dr Nikunj Trivedi (a Council Officer of the HMA) studied homeopathy in V.H. 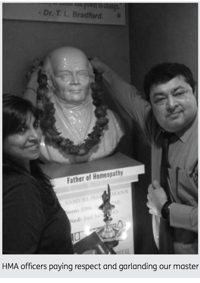 Dave College, Anand and practised homeopathy in Anand for 25 years prior to coming and settling in UK in 2004. Dr Trivedi, who is a life member of the Gujarat Homoeopathic Medical Association, Anand branch arranged for this trip to take place with their kind co-operation. For most of the group, including myself, it would also be our first visit to India, so we were also excited about experiencing Indian culture and sights. We flew to Mumbai and then took an internal flight to Ahmedabad in Gujarat. From there we took a taxi to Anand which is where we would be staying. That journey was our first unbridled experience of India! We were driven at speed with horn blaring, (fewer rules here) skirting through and around a seething morass of cars, lorries, motor bikes, auto rickshaws, bicycles, scooters, plus a few cows and stray dogs! Later in the trip a few of us were reflecting that the traffic looks somewhat chaotic but everything seems to flow, as in the Indian Culture â€“ and if you go with the flow everything works out fine. We checked into our hotel, Laksh Prime Residency, and after freshening up we had a meeting with the principal, professors and doctors from the Shri Ramkrishna Seva Mandal Anand Medical College and Research Institute and Anand Homoeopathic and General Hospital where we were to visit and sit in. We were welcomed and introduced to the Principal of the College, Dr Neelam Trivedi, and some of the doctors and lecturers, and we in turn introduced ourselves. Anand Homoeopathic College was established in 1980 and was the first in the state of Gujarat to start the Bachelor of Homoeopathic Medicine and Surgery (BHMS) degree course. The duration of the course is 5 â€¢ years including a one year internship training at Anand hospital. There are one hundred students in each year group. 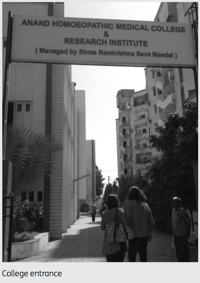 The college is a grant- in-aid college and the internees draw a salary from the Government of Gujarat. Anand Homoeopathic and General Hospital provides teaching facilities to the 2nd, 3rd and 4th year students and interns. Approximately 15,000 to 20,000 patients a year are treated in different departments including homeopathic medicine, surgery, gynaecology, ophthalmology, ENT, skin, psychology, dentistry and paediatrics. The hospital also has its own pathology laboratory. On our first morning we visited the hospital. On our arrival we saw hundreds of shoes in racks and on the ground outside the entrance. In India it is quite customary to remove your shoes when going inside many buildings, including hospitals but of course for us it seemed very unusual. Some doctors remove their shoes also but change into footwear reserved for indoors, however we were allowed to keep ours on! On our first day we met Dr Anshu Shah, the Resident Medical Officer and he introduced us to some of the interns who gave us a tour of the hospital facilities. We were shown the reception, out-patients department and dispensary, the homeopathic and allopathic doctorsâ€™ consulting rooms, the in-patients gynaecology ward, the obstetrics department, labour rooms, operating theatre and delivery room. We were also shown the clinic where immunisation is provided free of cost. In the afternoon we went to the college and had an introductory tour there. We saw the lecture theatres and all the different departments of the college which included Anatomy, Physiology, Pathology and Microbiology, Forensic medicine and Toxicology, Surgery, Obstetrics and Gynaecology, Community medicine, Homeopathic philosophy and psychology, Homeopathic pharmacy, Materia Medica and Therapeutics, case taking and repertory. In the anatomy and physiology rooms there were shelves and shelves of jars with human body parts and foetuses floating in them and we saw cadavers in tanks of formaldehyde, one of which we saw being dissected on a later visit! All rather different from our own experiences of college! It brought it home to us that Homeopaths in India are qualified as medical doctors and so their study of the sciences and medicine is far more detailed than on our homeopathy courses in the UK. We sat in on a first year lecture on Bryonia given by a post graduate student. The lecture was very lively and interesting and it was lovely to see the students so eager and lapping up the information. During the rest of our stay we sat in on various clinics at the hospital in the mornings, mainly with Dr Anshu Shah (general medicine), Dr Swati Mehta (gynaecology) Dr Chirag Tamboli (psychology), and Dr Nidhi Mankaad. (obstetrics and gynaecology). The Gujarati language or Hindi were spoken so usually the doctors would summarise the cases in English for us afterwards and we were able to ask questions, offer opinions and discuss remedy choices. We saw a variety of different prescribing approaches. Therapeutic prescribing was often used and we could see that, with the volume of patients, it would be impossible to take full cases for each one. It was all so very different from our experience of practising at home with just the patient and the practitioner in the office and an hour or more to take the case. Here, as well as the doctor and patient, the clinics were often jam-packed full of interns, our group and sometimes one or two relatives of the patient, so in some cases there were twenty or more people in a room. The rooms would have a central ceiling fan but even then the heat along with the numbers in the room was sometimes overwhelming for some of the group. On some clinics, it was observed that frequent interruptions sometimes occurred during case-taking; mobile phones would ring and be answered by both the doctor and the patient, hospital employees would come in with documents to be signed or with a question for the doctor, interns would come and go. Though seemingly distracting it was obviously a routine situation for the Indian doctors who took it all in their stride and got the job done! We saw patients with a wide variety of conditions ranging from eczema, gout, hypotension, osteofibroma and menopausal symptoms to autism and schizophrenia. The latter were in the psychiatry department where we sat in with Dr Chirag Tamboli. Here many of us felt more familiar with the style of case-taking as he spent longer with each patient and the mental, emotional and general symptoms were taken as well as physicals and used to select remedies. Most afternoons we went to the college and attended a variety of lectures. One was given by Dr Nikunj Trivedi from the HMA(UK) on infertility to undergraduate students, a lecture on menopause by Dr Swati Mehta and a series of very interesting lectures provided by Dr Tamboli on methodology, case analysis, levels of health and the Kingdoms, were given just to our group. We also had the opportunity, for a few evenings, to visit a private clinic called Shree Sai Homeopathic Hospital run by Dr Shah, who trained under George Vithoulkas. This was a very modern, private clinic with up to date facilities. We saw and discussed some extremely interesting video cases, including a child with Fukuyama Congenital Muscular Dystrophy and an older woman with extreme fears and panic attacks. Dr Shahâ€™s knowledge of the Organon was legendary and he gave us a lecture on causes of failures in homeopathic practice referencing paragraphs from the Organon to support his points. He also lectured on Jealousy in the Materia Medica. We also had the opportunity to visit the Dr.V.H.Dave Homoeopathic Medical College and Smt. S.I. Patel Ipcowala Homoeopathic Hospital which are situated near the huge Amul dairy for which Anand is famous. We were shown around the collegeâ€™s medical and homeopathy training departments and observed some cases in the outpatients department. We had a few days off during our stay, including Republic day which was a public holiday. We visited a charity school for blind children and joined in their Republic Day ceremony. It was very moving to see how these children, who would otherwise be begging on the streets, are being clothed, fed, educated and given a chance in life. We went to the nearby city of Baroda and visited a park, a temple to Hanuman (not Hahnemann!!) and, after dark, gardens with coloured fountains. We also did a bit of shopping and explored the bazaars and side streets of Anand, visited a couple of temples and joined in a puja (holy ritual) at one of them. It was wedding season when we were there and we saw many colourful wedding parades in the streets with horses drawing Cinderella style carriages, loud bands, dancing and fireworks. We usually ate in the hotelâ€™s terrace restaurant from where you could look out over the city and watch the crazy traffic below. The food was wonderful â€“ thatâ€™s assuming you like spicy food!! Even the breakfasts were spicy, so some of us took to ordering fruit and lassiâ€™s as spiciness at breakfast was a bit too much for our digestion! We all stayed healthy thanks to homeopathy, common sense and our immune systems! On behalf of the whole group, I would like to thank the HMA Council and everyone who was involved in organising our trip and all the principals, doctors and professors in India who gave up their valuable time to show us round, provide lectures and allowed us to sit in on their clinics. We learnt a lot about how homeopathy is regarded and practised in India and about the training for homeopathic doctors in India. We also very much enjoyed experiencing Indian culture, food and sights. Sorry for the late reply, but life has been a whirlwind since returning! It sounds like it's the same for you. The trip to India has certainly had a big impact on me and I am not sure why. I am really happy that I met each and every person there and I think we will remain friends, at least I hope so! I feel it was a great experience, not just for the learning of homeopathy, which I have to admit was tricky with the language at times and as you say indian timing, but to experience the culture and to go somewhere like no other place I have been before! I would like to thank you for working so hard in arranging things and making sure we were all kept safe and happy! I know this was not easy for you at times and I hope it didn't spoil things for you. It was very much appreciated! I have been trying to put a few of my new learnt things into practice, but not finding it easy! How about you? I would like to thank the HMA for organising the amazing trip to Gujarat, India and for the wonderful experience this gave me. I found the trip to be amazing in so many ways, firstly this was my first trip to India so it was a whole new exhilarating experience for me; then to have the opportunity to experience the homeopathic college, to witness the high standard of teaching there, the large numbers of young people choosing homeopathy as their degree course, and the enthusiasm and commitment of the students and teachers. And also we were given access to the hospital where homeopathy and allopathy are sharing the same space and working together. We were allowed to sit in on the patient consultations, to receive an overview from the Doctor, and to understand how they are achieving their high quality results. I was very impressed with the passion of the homeopathic doctors, students and tutors and felt privileged to be able to experience this. In addition we were greeted with such warmth and made so welcome by all. Some aspects of the visit were not as I had expected, it did initially take a few days to sort out what we would be doing, possibly better pre-planning would have helped to get more out of the trip, but â€˜hey hoâ€™ it was great. A special thanks to Seema whose leadership allowed our group to get the most out of this opportunity, she coordinated â€˜on the groundâ€™ in what at times were difficult circumstances, and guided us â€˜India novicesâ€™ through the complexities of such a different culture. Without Seemaâ€™s calm and measured leadership the trip would not have been so fruitful and enjoyable. And not forgetting Balbir who assisted with his joyful good humour at all times.